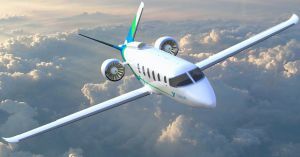 Electric passenger planes could finally be practical. There’s a new kind of battery coming out of an MIT materials science lab — one that packs enough of a punch to power an airplane long enough to fly up the Californian coastline, according to the MIT Technology Review. Engineers have long dreamed of flying electric vehicles, but they’ve often been stymied by the seemingly impossible-to-strike balance between battery weight and power. But now the MIT scientists, let by Yet-Mind Chiang, think they’ve found an answer. By physically restructuring a battery so that the flow of electricity is more direct from one electrode to the other, the researchers believe that the new battery will discharge rapidly and powerfully enough to lift a 12-seat plane off the ground and keep it off long enough for some short-range — but commercially-viable — flights without using fossil fuels. An era of battery powered planes would eradicate one of our major sources of greenhouse gas emissions — according to MIT Tech, air travel generates two percent of all the carbon dioxide we release into the atmosphere. The ultimate goal is to get these batteries bigger and better so that they could power the planes you and I use. But for now, those few with their tiny, private planes can invest in some green tech and serve as benevolent guinea pigs in our stead.